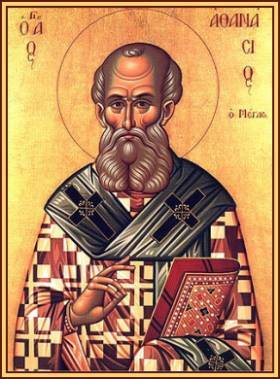 St. Athanasius, Bishop of Alexandria and a great defender of the orthodox faith, throughout his life opposed the Arian heresy. By denying the Godhead of the Word the Arians turned Christ into a mere man, only higher in grace than others in the eyes of God. St. Athanasius took part in the Council of Nicea in 325 and until the end remained a champion of the faith as it was defined by the Council. In him the Church venerates one of her great Doctors. He was subjected to persecutions for upholding the true teaching concerning the person of Christ and was sent into exile from his see no less than five times. He died at Alexandria in 373 after an episcopate of forty-six years. Read more here. Marcellino D’Ambrosio has a selection of the Saint’s writings (scroll down). Ignatius Inside Scoop has more on St. Athanasius here. This entry was posted in Catholic, Saints and tagged Council of Nicea, Doctor of the Church, St. Athanasius. Bookmark the permalink. and yet, I cannot help wodiernng that if Gods people move towards holiness, creation moves towards holiness as the church becomes more open to Holy Spirit. I would support a view of 2 Chronicles 7:14 that directly relates the church (or Gods people, as the passage puts it) to the state of ecology, both towards and against restoration. Given that Christ has dominion over all things, and we are unified with Christ (Philippians 2:1), then I wonder what the extend of our role is?